Supporting Microsoft Windows 7 and 10. The HI-TECH SCIENTIFIC range of instruments are high performance, precision, world class products producing publication quality data for cutting edge research. Our latest instruments break new ground helping scientists around the world lead the way with their discoveries and understanding. Kinetic Studio is the perfect complement providing you with an easy to use, intuitive, flexible and reliable interface to our instruments. Speeding you through the acquisition setup, guiding you where necessary and making data handling, management, processing and navigation simpler than ever before. Data handling is greatly enhanced by the ability to store data sets as “thumbnails” for easy visualisation and recall. 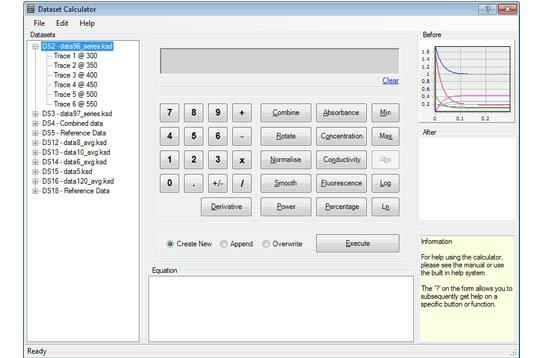 Kinetic Studio allows you to quickly and easily identify a data set by name or by trace. Operations can be applied to the currently visible data set or to one or more thumbnail data sets. Each thumbnail has a context sensitive menu allowing efficient access to common actions such as: Display, duplicate, combine, average, rotate, extract, rename, remove, properties. Context menus dynamically adjust to the suit the data and area of the application you’re in. Help is readily available and contextually aware of features you’re using, press F1 and assistance is not far away. Wizard style dialogues guide the user through the system in an interactive way and greatly simplify many areas of set up and operation. Real-time acquisition progress – When shots over many seconds are acquired, it can be invaluable to see your data being returned ‘live’. 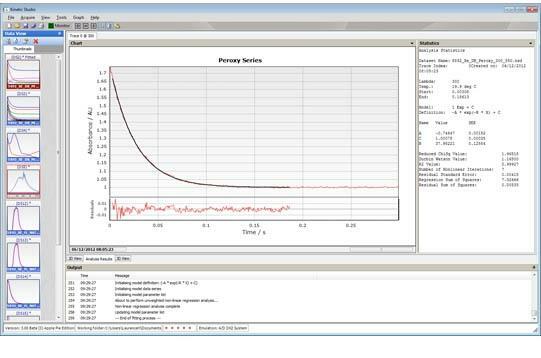 See instantly how your experiment is progressing and avoid potential loss of productivity. 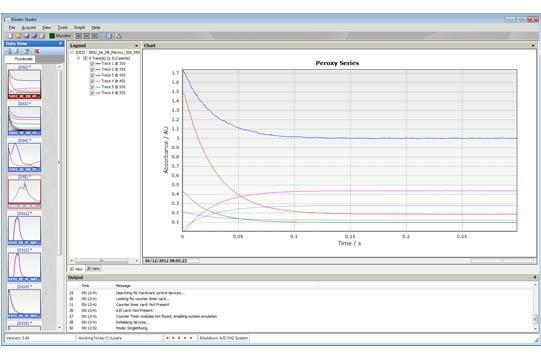 Graphing facilities are an integral part of the main program. Traces can quickly and easily be identified through interactive colour coded trace descriptors and annotations or notes may be added to highlight areas of interest for presentation purposes. 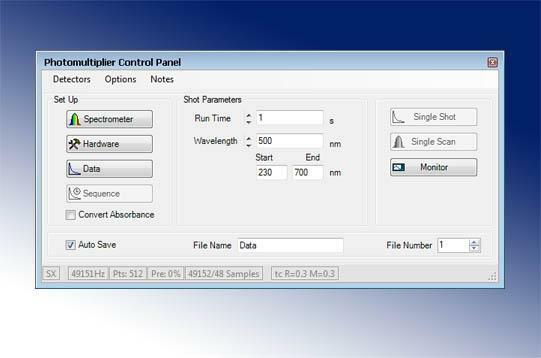 A programmable Multi-Shot capability offers flexible multi-wavelength and age-time analysis, allowing accurate resolution of spectral information even over fast time courses. 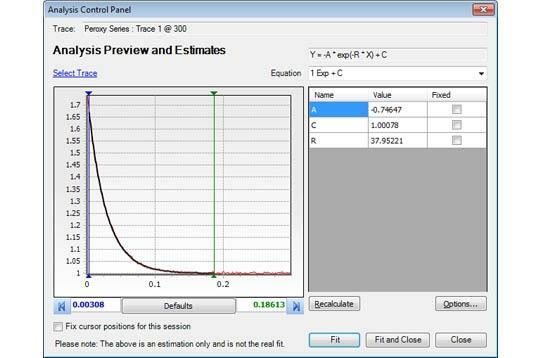 This greatly extends the range of reaction systems that can be studied. 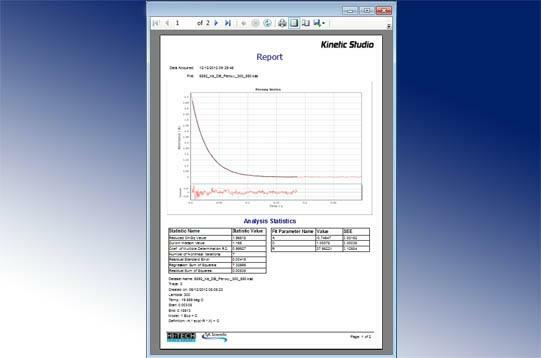 Data Analysis / Fitting – Kinetic Studio provides you with all the fundamental features required for quick, convenient and powerful data analysis and fitting. 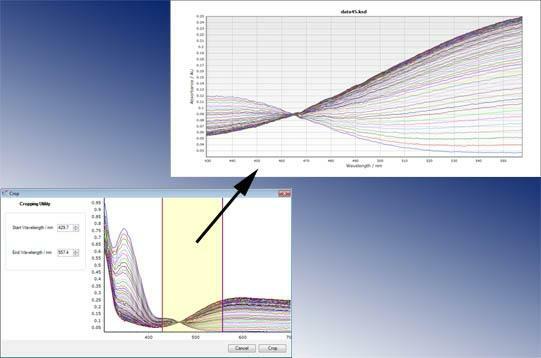 Whole data set and Inter-trace manipulations are available without needing third party applications. An easy export facility brings compatibility with other data processing packages popular with kineticists, such as ReactLab, SPECFIT/32, ORIGIN, KaleidaGraph and THE SCIENTIST. 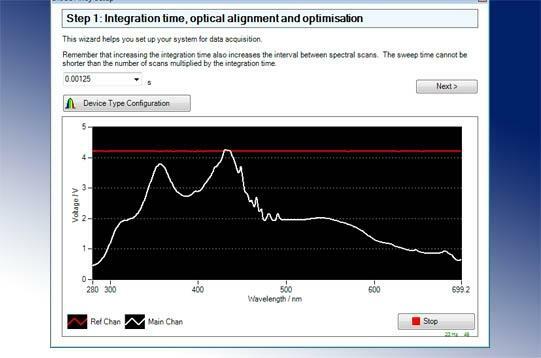 Ocean Optics software – Kinetic Studio provides support for the Ocean Optics range of miniature fiber connected spectrometers. A new viable option for time resolved and steady state measurements using Ocean Optics devices. Get in touch if you would like more information about any of our instruments or services.